By talking about the role businesses play in curbing climate change, here is Scope 5’s vision for repairing our planet. We believe that businesses can significantly reduce greenhouse gas emissions if market forces compel them to step forward. This starts by changing how these businesses account for carbon emissions. In a perfect market, business leaders rely on market forces to drive the prices of goods and services to the ‘right’ equilibrium price. Certain actors are rewarded for ‘good’ behavior. Others are penalized for ‘bad’ behavior. For example, drivers that drive safely will tend to pay less for car insurance, while reckless drivers will tend to pay more. But markets are not perfect. Imperfect markets are enabling behaviors that are leading us towards harmful, irreversible climate change. The fundamental problem is this: The true costs of carbon emissions are not incurred by the actors responsible for generating those emissions. These shifted costs are referred to as externalities. Our best hope lies in correcting these imperfections: making carbon emitters pay for the costs of their emissions. In other words, internalizing externalities. We cannot truly internalize the costs of carbon emissions until all emitters are charged a meaningful price for the emissions they generate. Today, a small number of companies in some parts of the world do pay a price for their carbon emissions in one form or another. But there’s a lot of work to do before the costs of emissions externalities are properly internalized. While an important part of this work is legislative in nature, much of it lies in refining the practice of emissions accounting. In the following sections, I’ll discuss the current state of emissions accounting and identify several specific problems with the practice. We’ll cover promising trends with the potential to address these problems, and how the practice might evolve to properly internalize the costs of carbon emissions. Emissions accounting today is driven largely by emissions reporting. In 2003, the Carbon Disclosure Project (CDP) issued its first climate change questionnaire on behalf of thirty-five investors, compelling companies to account for their carbon emissions and to report the results. Two hundred and forty-five companies responded. Since then, the number of reporting frameworks like the CDP has grown, as well as the number of companies reporting under these frameworks. In 2017, investors represented by the CDP compelled nearly six thousand companies to account for their emissions and report their results. Thousands more reported under the Global Reporting Initiative (GRI) framework. Lack of standardization – emissions factors vary widely and details remain murky. No universal price on carbon. Companies account for their emissions on an organization-wide basis and aren’t able to allocate carbon costs on a per-product, per-unit basis. As a result, reporting companies are, insofar as carbon market-pricing signals are concerned, islands unto themselves. The result: carbon emissions externalities are not properly internalized. The carbon accounting methodology practiced today has been developed by the Greenhouse Gas Protocol (GHG Protocol). This methodology will play a crucial role in internalizing the costs of carbon emissions but still needs to evolve. Carbon accounting relies on emission factors. These convert measures of emissions-generating activity into actual carbon emissions. For example, combusting one gallon of gasoline produces about 20 lbs. of carbon emissions. There are multiple authoritative sources of emissions factors; the IPCC, the EPA, and DEFRA, to name a few. Emissions factors for the same activity vary from authority to authority. Authorities routinely issue updates, changing the factors but it is often unclear exactly when these updates are intended to go into effect. To further complicate matters, most activities emit gases, other than carbon dioxide, that also have a global warming impact. These emissions are converted to carbon dioxide equivalent (CO2e) numbers using global warming potentials (GWPs). GWPs are generally issued by the IPCC but these too vary from time to time. There are currently five IPCC assessment reports. The latest, AR5, adjusts GWPs for the fourth time since the first assessment report. In addition to the lack of standardization around emissions factors and GWPs, there are aspects of emissions accounting that are simply unspecified. The most glaring of these is the way emissions should be distributed over time. For example, companies often rely on their utility suppliers’ invoices to measure their utility consumption. Should companies account for the related emissions as occurring instantaneously on the date of the invoice, or as distributed uniformly over the service period invoiced? Or some other way? Once a company is able to quantify its emissions, those emissions must be converted to a common currency, using a carbon price in the form of dollars per ton. There is no universally agreed upon price on carbon emissions. Stanford University notes a carbon emission price range from $37 per ton at the low end to $220 per ton at the high end. Perhaps a universal price on carbon is not necessary. Many markets are somewhat segmented. But some agreement on pricing is necessary, at least locally. Today’s carbon accounting methodology requires each company to quantify the emissions resulting from their operational activities and combine those with upstream and downstream emissions associated with the goods and services that they buy and sell. Operational emissions are identified as Scope 1 and Scope 2 emissions. Upstream and downstream emissions are identified as Scope 3 emissions. Eventually, when costs of carbon emissions are properly internalized, each company will send clear market signals by increasing the per-unit dollar cost of the products they sell to their downstream customers. Since customers choose vendors largely on price, market forces will reward vendors that emit less. Until then, vendors will not be passing emissions costs to their customers in dollars. Instead, the burden is on reporting companies to estimate the upstream emissions associated with the products they buy. Few of these companies have access to the kind of granular Scope 3 information that would enable them to choose vendors based on upstream emissions. Recently, various initiatives have emerged that seem to be moving the practice of emissions accounting in the right direction. Let’s take a look at a few of these initiatives. There have been various top-down initiatives to price carbon emissions on a large scale. These include carbon taxation schemes (such as British Columbia’s carbon tax) and emissions trading schemes (such as the European Union’s ETS). In recent years, some individual companies have started pursuing a bottom-up approach. The CDP reports that in 2015, the number of companies implementing a carbon-pricing scheme tripled to 437, with 500 additional companies planning to put a carbon price in place by 2017. Companies vary broadly in their application of carbon pricing. Microsoft is overhauling its internal accounting to push the costs of its emissions down to the individual business units responsible for those emissions. In doing so, Microsoft is developing emissions accounting practices that help set the stage for all companies to internalize the costs of emissions. Over the past several years, we’ve seen an increased focus on value chain or Scope 3 emissions. In 2013, the Greenhouse Gas Protocol published their Guidance for Calculating Scope 3 Emissions. The paper identifies fifteen different upstream and downstream emissions categories and provides guidance on how to estimate these. The CDP quickly picked this up and respondents to its climate change questionnaire are required to identify and account for Scope 3 emissions in each of these categories. In fact, the CDP even started helping respondents do this. In 2015, the CDP used generic industry models to estimate Scope 3 emissions for a Scope 5 client. The Scope 3 Guidance from the GHG Protocol discusses various methods for quantifying upstream emissions for particular goods and services, ranging from the use of product-level supplier specific data to relying on broad industry averages based on dollars spent on the product. Obviously, the more product-level, supplier-specific data companies track, the more accurately emissions costs can be internalized. But the burden of estimating emissions for upstream goods and services falls on the reporting company or the supply chain customer. 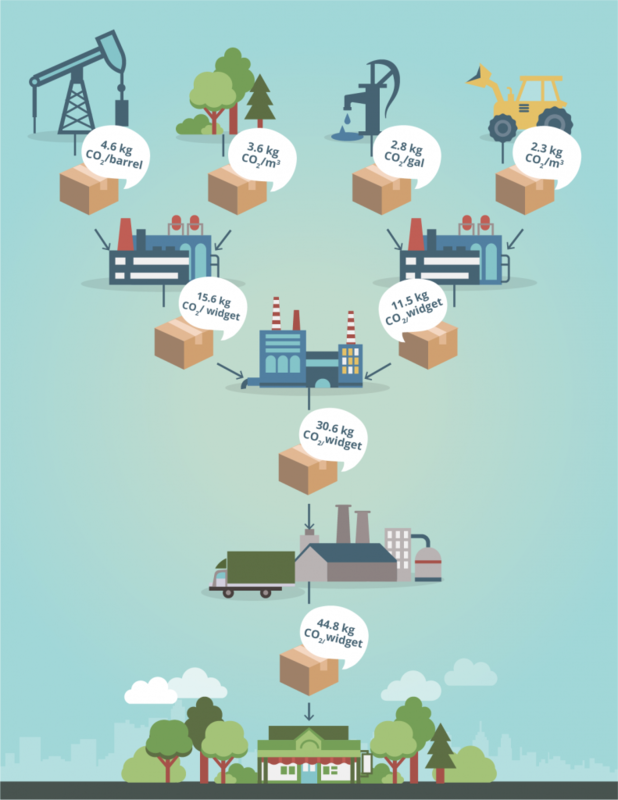 In our view, the supply chain supplier is in the best position to quantify the emissions on the product they supply. We’re starting to see the path towards internalizing the costs of carbon emissions more clearly. The legislative work advances in fits and starts. Presently, only a small number of companies are bound by mandatory reporting rules and carbon fees. The Paris climate agreement, although non-binding, is helping to further drive legislative progress around the world. But for our purposes, we’re less concerned with the legislative issues and more with the evolution of the appropriate accounting infrastructure. The Sustainability Accounting Standards Board (SASB) was founded in 2011 with the mission of maintaining sustainability accounting standards. Today, SASB focuses primarily on identifying material emitting activities across different industries and less on defining the kind of standardized accounting methodologies discussed previously. By simply identifying the need for sustainability accounting standards SASB is moving the practice forward. One of the next steps is for one of the recognized authorities (SASB or the CDP, for example) to unequivocally require a specific source of emissions factors and global warming potentials to be used for emissions accounting. At present, authorities tend to recommend rather than require specific sources. In addition, one authority or another needs to step up to specify methodological details of emissions accounting that currently remain unspecified. One such example is how accounted emissions should be distributed over time. Continued progress can be expected in both top-down and bottom-up carbon pricing efforts. Washington State put the first US carbon tax initiative on the ballot in 2016. Although the initiative was rejected (60% opposed to 40% approved), simply getting it on the ballot was an important landmark and related efforts continue to push for passage of a mandatory carbon tax. From a bottom-up perspective, more companies are adopting carbon-pricing schemes. These bottom-up efforts are helping to normalize the internalization of emissions externalities in corporate accounting. For many companies, Scope 3 emissions far outweigh their own operational emissions. Yet the opacity of these emissions means that companies cannot exchange meaningful carbon-pricing signals. There is a relatively simple fix to this problem: emissions accounting methodologies should require companies to allocate emissions costs to individual products in a manner that mimics their allocation of dollar costs. All companies must have a reasonably clear understanding of their dollar cost for each unit of each product they sell but few have an understanding of the emissions costs of their products. This isn’t hard to do. A company’s emissions costs include their own operational costs (whether overhead or product-specific process costs), as well as those costs that are passed down by their suppliers. These costs can then be allocated across products just as dollar costs are allocated. Companies can then specify a per-product, per-unit emissions cost. This concept is illustrated in Figure 1. By requiring companies to follow this emissions accounting and reporting process, they can make these numbers available to their customers. As more and more companies step up to do so, full cradle-to-grave emissions costs will become available for more and more products. I envision a world in which the practice of emissions accounting evolves, together with legislative action, to internalize the costs of carbon emissions and to unleash market forces in the service of combatting climate change. Three critical pieces of the evolution of emissions accounting include continued standardization of accounting methodologies, the pricing of carbon emissions, and the discipline to allocate and communicate emissions costs on per-product granularity. In my position as CEO of Scope 5, an emissions data management software provider, we are helping advance each of these pieces. Our software is already tackling such accounting details as the appropriate distribution of emissions over time. By supporting fine-grain emissions accounting we’re facilitating the institution of corporate carbon pricing such as Microsoft’s internal carbon fee and the allocation of emissions on a per-product, per-unit basis. Looking ahead, we are working with our customers to encode their per-product, per-unit emissions costs, so they are readily available to downstream consumers for their Scope 3 reporting needs.